Aryeh "Lova" Eliav, one of the senior members of the Labor movement and political party, died Sunday at the Sourasky Medical Center in Tel Aviv at the age of 89 after being admitted there due to an illness. President Shimon Peres said of Eliav, "Throughout his life Lova Eliav excelled in maintaining a personal as well as a leader's pioneering spirit. As far as he was concerned a leader's responsibility was not to be superior but to be a pioneer." Peres also noted Eliav's contribution to the population of the south. "His contribution to the development of the Negev which includes the settlement of Hevel Lakhish, the establishment of Arad and the success of Nitzana are marked as glorious trail marks in the paths of the State of Israel. "Lova always searched for the most challenging, difficult and pioneering places and was an exemplary model for generations in the State of Israel." Defense Minister Ehud Barak said, "Lova was a fighter, an educator, a pioneer and a receiver of aliyah." Eliav served as a Knesset member from 1965 to 1979 and from 1988 to 1992. He acted as deputy minister in 1966-1968. He withdrew from the Labor movement in the 1970s following his objection to settlement in the occupied territories but later returned to the party. Eliav won the Israel Prize award in 1988 for his unique contribution to the State of Israel. In 2009 he underwent a stroke which impaired his speech. He was born in Moscow in 1921 and immigrated to Israel at the age of three. At 15 he joined the Hagana and volunteered with the British army during WWII. After the war he helped bring Jewish immigrants to Palestine. He spent his IDF service in the Navy and was discharged in 1949 as a lieutenant-colonel. Eliav worked under former Prime Minister Levi Eshkol in the Jewish Agency after the establishment of the State of Israel. He later worked in Israel's Moscow Embassy. Upon his return to Israel he became one of the founders of the city of Arad. He served as deputy trade and labor minister in 1966-1967 and as deputy immigration absorption minister in 1968-1969. He also served as Labor Party secretary-general in 1969-1971. Following the Six-Day and Yom Kippur wars Eliav reached the conclusion that Jewish settlements in the occupied territories should be evacuated. State leaders at the time opposed this stance, leading Eliav to withdraw from the party in 1975. He spent the late 1970s in the Left Camp of Israel faction which demanded full withdrawal from the West Bank and Gaza Strip and opposed religious coercion and the discrimination of Arab-Israelis. He eventually returned to the Labor Party and served as one of its Knesset members until 1992. As part of his social activities Eliav founded the Nitzana Youth Village in 1986 on the Egyptian border. 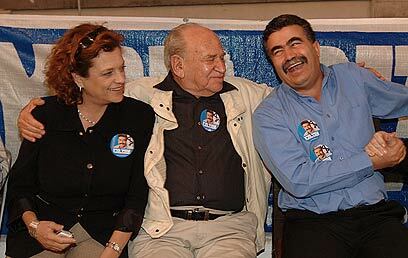 See all talkbacks "Former Labor leader Aryeh 'Lova' Eliav dies at 89"